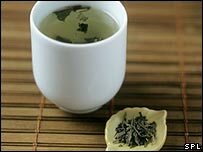 "Our research shows that drinking green tea could reduce the risk of becoming infected by HIV, and could also slow down the spread of HIV...."
The way green tea blocks HIV, they say, has to do with the green tea catechin epigallocatechin gallate (EGCG), an antioxidant that is found only in green tea. Molecules of EGCG bind to the same site on immune system cells through which HIV usually enters the cells, thus effectively shutting out the virus. "[Green tea] is not a cure, and nor is it a safe way to avoid infection, however, we suggest that it should be used in combination with conventional medicines to improve quality of life for those infected...."
Still, it's amazing how many benefits of green tea have been discovered in the relatively short time that modern science has been investigating this wonderful beverage. And to think, all those years I was drinking green tea simply because I liked it! The good news about green tea just keeps rolling in.